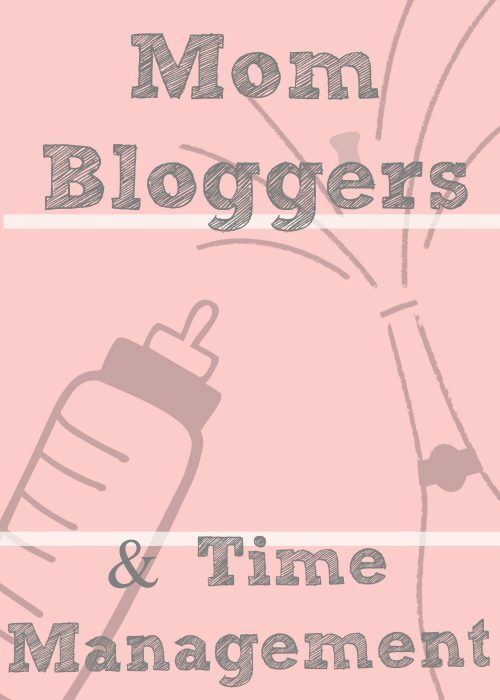 Note: Although part of my series on mom bloggers, this post on time management can apply to a variety of people. Moms are just one example of people who juggle multiple priorities. Today, a lot of women are balancing both career and motherhood. Some are working from home and are telecommuting, others run businesses from their homes. Still more are finding they can make money blogging about motherhood (a topic we discussed last time). 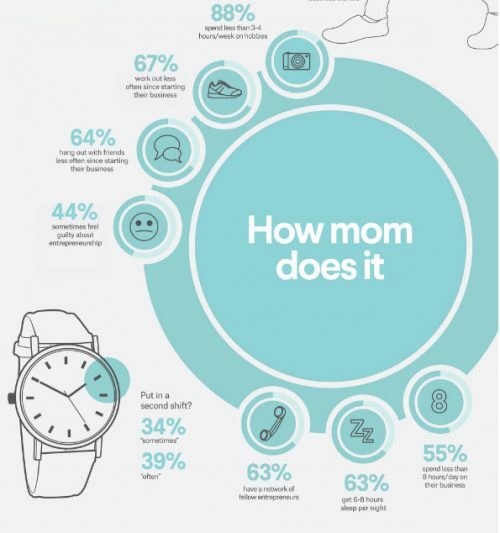 Interestingly, 95% of mom entrepreneurs — those who aren’t working for someone else — have a spouse/significant other who generates the primary source of income, according to Entrepreneur. Moms with young children can save money on childcare costs by keeping the kids at home. However, with that comes another distraction for the work-at-home mother. All this means is that time management is crucial for those moms who work from home to provide supplemental income, especially those starting a business. That also means making sacrifices. In order to grow their businesses, many moms cut or eliminate entirely other areas of their lives way, as seen in the infographic below. Common areas that get neglected include social life, working out, and any of their usual hobbies. One thing that makes me happy to see is that a good night’s sleep still seems to be a priority among the working from home mom, with 6-8 hours being the average (since I’ve been hearing a lot of “You’ll never sleep again!”, a 6 hour night seems pretty decent). In terms of managing work time vs. household and kid time, there are several ways to approach things. Separate work-time and home-time as much as possible. For many, this means having a designated work area (that is also recognized by other family members as such). It also means setting aside time to be in that area and being as productive as possible. One of the best ways to maximize productivity is to figure out the time of day when you are most productive and make that your dedicated “work time” if possible. It’s about setting up a work/home barrier for your own productivity and establishing a routine and boundaries for the others in your household. Create a Schedule. As I mentioned earlier, flexibility was a big reason why many moms choose to work from home. Flexibility doesn’t necessarily come without a schedule, though. While the routine may vary from day to day (i.e. one kid goes to daycare on Tuesdays and Thursdays only, someone has a doctor’s appointment coming up, etc), creating a schedule for yourself (and your family) is one way to stay on top of work flow. Work with Your Family. I read this blog post about a woman who was able to work at home without sacrificing any time with her family, which I find pretty appealing. She talks about how she learned to adjust her working habits — from learning to work outside where her daughter slept best to typing while her husband drove on longer car trips. Odds are there are areas where you can compromise and have the best of both worlds. Unfortunately, since every family and kid(s) are so different, I can’t offer any “do this one thing” tips on making this feasible — it will probably require some trial and error on your part. Learn to say “No.” This means learning to say no to taking on more work than you can handle and even saying “no” to yourself when you start getting distracted by things like social media and the dishes sitting in the sink. Sure, you could probably multitask as many things as possible, but that’s probably going to make you feel crazy and, eventually, burnt out. Say no to the things that are going to hurt you rather than help you in the long (or short) run. Learn to Say “Yes.” Gotcha! Sometimes, you need to learn how to say “yes” when people ask to help you. Or, maybe you need to take some initiative and let people know when you need help (something I’ve learned in life is that no one can read my mind, no matter how much I’ve tried to get them to). Maybe you’re a perfectionist and worried things can only get done the “right way” if you’re in charge. Or maybe you’re convinced that people are counting on you to do “all the things” and you’re afraid to fall short of that. Accepting help around the house, arranging a carpooling situation with childcare, or delegating certain tasks (even to older kids) can help keep things on an even keel. Does working from home mean you are suddenly relaxed and attractive? Stock photography seems to think so. Check out istockphoto.com for more hilariously inaccurate gems like this. People think a lot of things about working from home, like somehow those who do have some magical gig where they get paid to watch reality television and eat Lucky Charms. For the first three years of Breaking Even, when it was only me, I worked from home. I read the usual tips about working from home. The ideas typically include things like putting on ‘real’ clothes and starting at a set time. In other words, treat it like a normal workday where you’d leave and go work elsewhere. I am completely behind this concept. 1) transition ritual where you transition into work and out of work. For most people, that’s what their commute does for them. 2) discipline to train others and yourself not to distract you. Because how other people react with reinforce (or undermine) what you are trying to do. My former office at home. Cute but having to have it in my living room meant I had to create my own work-life boundaries. You can too. My transition ritual into work involved taking a shower, drinking french press coffee, and walking my dog. I would then feed my dog, feed myself and then start work by 9 am. Yes, even in my 220 square foot studio apartment with a three step commute from my bed to my desk, I needed a ritual. For the start of the day, I recommend a combination of getting things done, eating breakfast, and anything you need to do that involves feeling like you are ‘waking up’. My transition ritual out of work usually involved doing something moderately mindless like some data entry while watching a 20ish minute television show on Hulu. This way I was able to eek out an extra few minutes of productivity while getting into relax mode. To end your work day, I recommend doing something that needs to get done businesswise but is kind of tedious (like putting in payments into Quickbooks or updating your email Contacts list) while feeling like you are ‘relaxing’. These are my recommendations. Experiment and see what works for you! Ask other people how they do it and read other people’s experiences and you may find something you haven’t thought of. Some people’s rituals will fascinate you. I once read about someone who got dressed, got in their car, drove around the block, parked in their driveway again, and walked back in the house to start their work at home day. The only thing that matters is finding an into work and out of work ritual that work for you. Even if they are a little insane. If your significant other comes to your house at the end of the day and comments about how you haven’t done the dishes, set that crap straight. If your friends try to Facebook chat with you, ignore them. If you find yourself starting to think about cleaning your bathroom or rearranging your closet by color, put the idea on a list to get it out of your brain and keep working. The temptations of being at home are numerous. Sometimes you have a noble purpose of wanting to be productive so your family will wow at how you juggle both work and home in an effortless way. Sometimes you are trying to procrastinate and you feel like a naughty kid getting away with something when you do it. Or it could be that your friends have worked with other people all day and the only conversation you’ve had is with the mailman and you are a touch lonely. These are all valid. But these temptations trying to pass off as needs can not be met during your workday. In terms of being good to yourself, give yourself a break, one in the morning and one in the afternoon just like legally they’d have to give you if you worked at a job outside your house. I used to keep a kitchen timer on my desk at home and when it went off, I could stop working and take a break (usually after 2 hours). Use your break time to do some dishes (if you really want) or chat with people on Facebook (if you really want). Thing is it’s your break so do something that feels like a break. It is up to you but I recommend getting away from the computer if you can for it to truly feel ‘breaky’. In terms of other people, it may take a few months to set expectations. People who aren’t in your situation aren’t trying to be jerky, they just don’t understand. So take some time and let them know you can’t talk because you are in the middle of something. Follow discussions up with behavior that is consistent with what you are saying: don’t answer personal phone calls during the work day, keep chats under five minutes that aren’t work related, and let people know they can’t just stop in because you may have a conference call or other time sensitive activity scheduled. The interruptions will die down and people will respect that you are working when they see that you aren’t doing fun stuff between 9 to 5. Or whatever set time you’ve established. ‘I don’t call you during the day anymore because I know you’re working.’ one of my friends said to me a few days ago, completely unsolicited. Exactly. On the same level, I keep work stuff separate too. I don’t answer work calls during non work hours. If something is urgent, people will leave a voicemail and I can call them back. I try to take one full day off from the computer every week (usually Sunday). Because while you don’t want life to interfere with work, you also don’t want work to interfere with life. Will you seem like a hardened drill sargent by enforcing this boundary? To some maybe. But this is your life we’re talking about and anyone who needs you to be available to them 24-7 with no regard to your needs or sanity is not someone you want to be buddy buddy with anyway. The enforcement stage usually is only a couple months until people get used to your schedule. And as they respect it, you’ll find yourself starting to respect it more too. Working from home? It’s not that difficult but it takes a certain kind of person to do it well. Be that person.